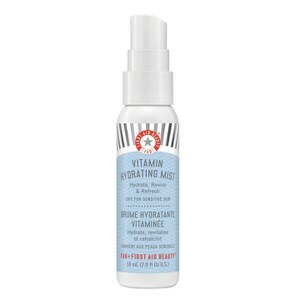 Keep your skin protected and perfected with the First Aid Beauty Vital Greens Face Mist, a cooling facial spritz that instantly quenches skin whilst setting makeup in place. Infused with a cocktail of green superfoods, including Kale, Spinach and Spirulina, the antioxidant-rich mist nourishes and protects the complexion, safeguarding against external aggressors and prolonging makeup wear for long-lasting, flawless skin. Rose of Jericho (known for its resurrecting abilities after extreme dehydration) effectively cools and soothes to leave the face refreshed and comfortable. Close eyes and mist liberally. Use after makeup application for lasting hold, or as needed throughout the day. Water/Aqua/Eau, Maltodextrin, Aloe Barbadensis Leaf Juice, Butylene Glycol, Polysorbate 80, Propanediol, Glycerin, Spinacia, Oleracea (Spinach) Leaf Extract, Spirulina Maxima Extract, Cucumis Melo (Melon) Fruit Extract, Selaginella Lepidophylla Extract, Brassica Oleracea Acephala Leaf Extract, Cucumis Sativus (Cucumber) Fruit Extract, Prunus Armeniaca (Apricot) Fruit Extract, Fucus Spiralis Extract, Santalum Album (Sandalwood) Wood Extract, Tetraselmis Chui Extract, Malachite Extract, Lactic Acid, Pyrus Malus (Apple) Fruit Extract, Rose Extract, Rubus Idaeus (Raspberry) Fruit Extract, Brassica Oleracea Capitata (Cabbage) Leaf Extract, Curcuma Longa (Turmeric) Root Extract, Lactobacillus Ferment Lysate, Chrysanthemum Parthenium (Feverfew) Extract, Camellia Sinensis Leaf Extract, Glycyrrhiza Glabra (Licorice) Root Extract, Caprylyl Glycol, Caprylic/Capric Triglyceride, Sodium Bicarbonate, BHT, Leuconostoc/Radish Root Ferment Filtrate, Lactobacillus Ferment, Phenoxyethanol, Disodium EDTA, Sodium Benzoate, Sodium Chloride, Potassium Sorbate, EDTA, Hydroxycitronellal.